A clear, easy to follow trail goes above the washout to the trailhead kiosk. To access the Earl Grey Pass Trail from the Toby Creek Trailhead, it is best to park at the trailhead and walk the 2 km to the park boundary; the road has been permanently deactivated. Follow the road while staying left along the creek to locate where the trail begins. For more information, please call 250 489-8540. For more information about hiking in the Purcell Wilderness Conservancy, read the Purcell Wilderness Conservancy Trail Information page. The Birchdale Trail continues for 2km beyond the Fry Creek bridge. This trail ends at private property and there is no designated trail access to the community of Birchdale at this time. The Purcell Wilderness Conservancy Park and Purcell Wilderness Conservancy Corridor Protected Area embraces six large drainages flowing east to the Columbia River system and three flowing west to Kootenay Lake. All of which emanate from the rugged and glaciated backbone of the spectacular Purcell Mountain Range of southeastern BC. 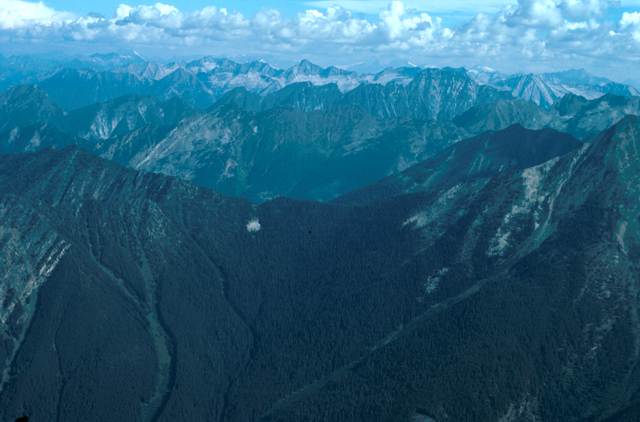 It is a challenging, undeveloped nearly pristine mountain landscape encompassing five biogeoclimatic zones and the only intact ecosystem in southeastern B.C. Visitors to the Purcells should be experienced, self-sufficient wilderness travellers capable of interpreting topographical maps and route-finding. Wilderness recreation values include hunting, fishing, hiking, cultural sites, climbing, horseback riding (on the east side of the Park only) and wildlife viewing. A special feature also in the park is the Dewar Creek Hot Springs. The Conservancy is a non-mechanized area. This means that the use of vehicles, ATVs, snowmobiles, bicycles and helicopters to access the Park are prohibited. A number of guide-outfitters offer hunting, hiking and wildlife viewing multi-day excursions. Persons visiting the Purcell Wilderness Conservancy Provincial Park, are reminded that the park is a wilderness area, without supplies, public shelters, improved trails, or equipment of any kind. All arrangements for supplies, rescue and transportation must be made beforehand. All park visitors should wear strong waterproofed, lug-soled boots and carry a daypack with raingear, extra warm clothing and food. Weather conditions can change suddenly in this area and lightning storms with hail and snow are common in summer. For overnight trips a sleeping bag, groundpad, waterproof tent or bivouac bag and lightweight stove are essential. Only experienced climbers practised in crevasse rescue and properly roped, should venture onto snowfields and glaciers. Loaded logging trucks and other industrial traffic may be encountered while accessing this park. Drive with extreme caution and for your safety, always yield to industrial traffic. The Purcell Wilderness Conservancy is home to a healthy resident grizzly bear population and visitors should be prepared for sightings. Recognizing recent signs, maintaining clean camps and remaining alert while travelling, are import for the visitor and bear safety. Most of the stream crossings in the park are un-bridged and must be forded. The major drainages may be in flood until the end of July and are at times not negotiable either on horse or foot. The exceptions are the 5 cable cars on the Hamill Creek portion of the Earl Grey Trail, the cable car over Carney Creek near the bottom of the trail to Kootenay Joe Ridge, the bridge over Westley Creek on the Dewar Creek trail, and the bridge over Fry Creek Canyon. Note that gloves are useful for pulling on the cable on the cable car crossings. Historical structures exist: use caution. Enjoy your visit to the Purcell Wilderness Conservancy and the Earl Grey Trail, but please leave it as you have found it so that future visitors may enjoy it as you have. Please practice no trace camping. Please be extremely careful with fire. Primus-type stoves should be utilized for all cooking. You will need a British Columbia angling licence if you plan to fish. Firearms are prohibited except during a valid hunting season. Please consult British Columbia Hunting Regulations for dates. Access to the east side of the Park is by gravel roads leading west from Highway 93/95 along Toby Creek, Findlay Creek, Skookumchuck Creek, St. Mary’s River and Dewar Creek. These roads are frequently used by industrial logging traffic – caution is advised. Distances vary from 35 to 75 km to the trailheads. West side trailheads at Hamill Creek and Fry Creek are accessed from Highway 31 by turning west at Meadow Creek and proceeding south along the east side of Kootenay Lake to Argenta or Johnson’s Landing. The Kootenay-Joe Road leads from near Johnson’s Landing to the height of land between the front range and the Conservancy. The Purcell Wilderness Conservancy Park is a non-mechanized area, access by vehicles of any kind is prohibited and enforced. Acquiring a backroad mapbook for the area is recommended. There are canoeing opportunities in this park. Although most alpine opportunities are remote the rugged back bone of the Purcell’s offers many climbing opportunities. There are unimproved horse trails in each main valley and routes into many of the side valleys and over passes. Rivers may be impassable during flood season, usually until the end of July. There are no bridges on the east side of the Park; hikers will have to ford creeks. Visitors should be able to read maps and be capable of route finding. Because this is a wilderness conservancy, the park has no facilities or marked trails and is not regularly serviced. Visitors should be self-sufficient and proficient in backcountry travel practices. For more information please see the Trail Information Page. Horseback riding and multi-day pack trips are permitted on the east side as defined by the height of land along the Purcell Mountains. Trails are unimproved, uncut and historical structures such as old bog bridges exist. Use extreme caution while crossing these structures and be prepared to cut out the trail. There are traditional horse camps along most trails. Please use established sites or practice no impact horse camping. Hunting is permitted in the park during open hunting seasons. Firearms may be carried by persons with a BC hunting licence during an open hunting season. Horse assisted hunting trips are allowed on the east side of the Conservancy during open seasons. Dogs in backcountry parks must be under control at all times. Backcountry areas are not suitable for dogs or other pets due to wildlife issues and the potential for problems with bears. There are refreshing swimming opportunities at this park in alpine lakes and streams. There are NO LIFEGUARDS on duty at provincial parks. There are abundant populations of birds and animals with elk, deer, goats, black and grizzly bears, wolverines, martin, beaver, coyotes, wolves, even the occasional caribou seen, and at least 90 species of birds. There are many wildlife viewing opportunities however, be aware that during the summer many animals take refuge at higher elevations. There are winter recreation opportunities for extended backcountry ski touring. Snow machines and aircraft are not allowed as the Conservancy is a non-mechanized area. Wilderness, backcountry or walk-in camping is allowed year-round when accessible but no facilities are provided. Travellers will come upon traditional campsites where impacts have occurred; campers are encouraged to use these locations. When toilets are not available, bury human waste at least six inches in soil and 30 metres from water. To ensure drinking water is safe it must be boiled for at least 5 minutes. Register a trip itinerary with friends, check in and check out. When practical, use impacted campsites; otherwise practice “Leave No Trace” camping ethics. If you have a fire, build it on rocks, or remove sod, have fire, then replace sod. The Conservancy is a non-mechanized area.